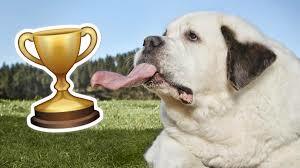 Eight-year-old Mochi, a St. Bernard dog, claims world record for longest tongue! It's about as long as a sheet of paper! Mochi “Mo” Rickert, an eight-year-old St. Bernard from Sioux Falls in America has set a new record with her massive tongue! It measures 18.5cm in length, which is about the same size as two glue sticks. Mochi is a rescue dog, meaning her owners adopted her from a shelter. They said it was “love at first sight” when they saw her. Unfortunately, the massive tongue means that she has a lot of slobber to deal with! The owners said it’s all worth it though, now that she has a world record. That’s what Mochi’s owner, Carla, said about her prize pooch.